Late on Friday, controversial for-profit college company Bridgepoint Education reported in a filing with the Securities and Exchange Commission that Marye Anne Fox, Chancellor Emerita and current Distinguished Professor of Chemistry at the University of California, San Diego, had resigned from the company's board of directors on Thursday, "effective immediately." Bridgepoint's filing says, "Dr. Fox's decision to resign from the Board was for personal reasons not related to any disagreement with the Company relating to the Company's operations, policies or practices." If so, the timing was bad. On March 1, University of California-Davis's current chancellor, Linda Katehi, resigned from the board of directors of for-profit college company DeVry Education Group just eight days after joining that board and after a California legislator and public interest organizations had criticized her. The Federal Trade Commission had sued DeVry in January for alleged deceptive advertising. The company also has been under investigation by the U.S. Department of Education and the attorneys general of Illinois, Massachusetts, and New York. Katehi's resignation from the DeVry board did not halt the criticisms, especially after it was discovered that she also serves on the board of college textbook publisher John Wiley & Sons. Five California Assembly members have now called on Katehi to resign as chancellor, and students demanding her ouster have been camped out outside her office. UCSD's Fox, who received the National Medal of Science from President Obama in 2010, joined the Bridgepoint board in November 2011 while still the UCSD chancellor, but after she announced that she would step down from that post in 2012. In an article on the Katehi controversy earlier this month, the Sacramento Bee noted a 2006 San Diego Union-Tribune report that then-Chancellor Fox was serving as a director for 10 corporations and nonprofit groups; seven of those board positions came with compensation, totaling $410,000 per year. This month's SacBee report did not note Fox's subsequent appointment to the Bridgepoint board. But being mentioned in the context of the Katehi controversy perhaps got Fox thinking. Fox joined the Bridgepoint board at a time when the company was facing public scrutiny for its questionable business practices. Senator Tom Harkin (D-IA) had begun a broad investigation of the for-profit college industry, and in March 2011 he held a hearing focusing on San Diego-based Bridgepoint. Bridgepoint had taken over a small Catholic college in Clinton, Iowa, for its accreditation, and turned it into largely online Ashford University. At the hearing, Harkin presented a series of charts showing that the company had seen rapid growth, with revenues increasing from $33 million in 2008 to $216 million in 2010, while experiencing mounting student loan default rates. Harkin said Bridgepoint was "a scam, an absolute scam ... premised on aggressively recruiting largely low-income, disadvantaged students ... collecting their federal grants and loans even as the vast majority of students drop out ... and lavishly rewarding executives and shareholders with mostly taxpayer dollars." He concluded, "From a strictly business perspective, this is a highly successful model. But, I must say, from an educational perspective -- and, frankly, from an ethical perspective -- it is deeply disturbing model." At the time Fox joined the Bridgepoint board later that year, according to a news report at the time, she "did not return a phone call requesting comment on the controversy surrounding Bridgepoint." In the past few years, Bridgepoint has been under investigation for potential fraud by the Securities and Exchange Commission, the Consumer Financial Protection Bureau, and at least five state attorneys general. Yet the company has continued to grow, last year receiving $639 million in taxpayer dollars from federal student grants and loans. However, the company's stock price has dropped from about $30 in mid-2011 to around $10 today. When Bridgepoint bought the Iowa college in 2005, and the town expressed concern about the future of the school and the jobs it provided, Ashford's president promised the Clinton city council, "We will never, ever get rid of the Clinton campus." 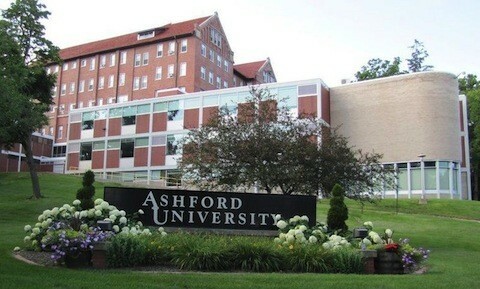 Last summer, Ashford announced it was getting rid of the Clinton campus. Bridgepoint announced earlier this week that it would "further strengthen the academic leadership of the University through the appointment of Dr. Craig Swenson to president of Ashford University." Swenson's predecessor, Richard Pattenaude, joined Bridgepoint in 2012 after serving for five years as chancellor of the University of Maine system. But Swenson's background is in for-profit education, running EDMC's Argosy University and then another Bridgepoint school, Denver-based University of the Rockies. For-profit colleges with troubling records have frequently brought onto their boards prominent people, including academics, whose reputations can help validate their institutions with government overseers, accreditors, and the public. Lee Bollinger, the president of Columbia University, is on the board of Graham Holdings, formerly called the Washington Post Company before it sold that flagship newspaper. Graham owns media properties but for years has made most of its money through its education division, which includes the troubled Kaplan for-profit colleges, exposed through media and law enforcement investigations for abuses of students. Bollinger has stayed on the Graham board despite activism by Columbia students calling for him to resign. Graham Holdings also owned a minority stake in one of the worst companies in the sector, now shuttered Corinthian Colleges, which added former Secretary of Defense Leon Panetta as a board member in 2013; he quit eleven weeks later after criticism from Republic Report and, subsequently, a Los Angeles Times columnist. National Urban League president and former New Orleans mayor Marc Morial, and American Association of Colleges for Teacher Education CEO Sharon Robinson remained on the Corinthian board through the company's collapse. Former U.S. congressman (R-MN) and prominent Washington lobbyist and GOP strategist Vin Weber serves on the board of troubled for-profit college company ITT Educational Services. University of Arizona president Ann Weaver Hart, who joined the DeVry board of directors at the same time as UC Davis's Linda Katehi, has said she is staying on that board.